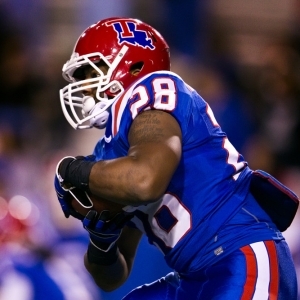 The Southern Mississippi Golden Eagles take on the Louisiana Tech Bulldogs on Saturday at Joe Aillet Stadium. The opening line for this game has Louisiana Tech as 6.5 point favorites and the over/under was set at 61.5. Southern Mississippi was led in passing last game by Nick Mullens, who finished with 302 yards through the air. He went 21 for 37 on the game, good for a 57% completion percentage. Jalen Richard led the Golden Eagles in rushing with 161 yards. He averaged 7 yards per carry on his 22 rushing attempts for the game. Casey Martin was the team leader in receiving with a total of 104 yards and 8 receptions. He finished the game with an average of 13 yards per reception. As a team in that game Southern Mississippi got a total of 33 first downs by way of 15 rushing, 15 passing, and 3 by penalty. They ran 85 total plays for 612 yards for the game. The Golden Eagles ran for 310 yards on 48 attempts. Louisiana Tech was led in passing last game by Jeff Driskel, who finished with 188 yards through the air. He went 13 for 22 on the game, good for a 59% completion percentage. Jeff Driskel led the Bulldogs in rushing with 42 yards. He averaged 7 yards per carry on his 6 rushing attempts for the game. Carlos Henderson was the team leader in receiving with a total of 78 yards and 3 receptions. He finished the game with an average of 26 yards per reception. Louisiana Tech got a total of 12 first downs by way of 5 rushing, 7 passing, and 0 by penalty. They ran 50 total plays for 307 yards for the game. The Bulldogs ran for 119 yards on 28 attempts. Southern Mississippi is averaging 40.2 points per game on the offensive side of the ball. They are completing 24.8 passes per game on 38.6 attempts for a 64.2 percent completion percentage and average 336 yards in the passing department per game. The Golden Eagles are running for an average of 197 yards per game on 36.7 attempts for an average of 5.4 yards per carry. They also run 75.4 plays per contest and average 7.1 yards per play for an average of 533 yards per game. The Golden Eagles are averaging 23.9 first downs per game and they accumulate 69.9 penalty yards per game via 7.5 penalties. Southern Mississippi gives up an average of 189.6 passing yards and 22.3 points per game on the defensive side of the ball. They allow 16.5 completions per game on 32.3 attempts for a completion percentage of 51.3. The Golden Eagles give up 156.5 rushing yards per contest on 36.6 carries for a 4.3 average per carry. Southern Mississippi gives up 346.1 total yards per game including 5 yards per play. They force 1.4 turnovers per contest and get flagged for 6.5 penalties per game that total 65.1 yards as a unit. Louisiana Tech is putting 37.9 points on the board per game on the offensive side of the ball. They complete 21.5 passes per game on 35.3 attempts for a 61.1 percent completion percentage and average 302.6 yards in the passing department for each outing. The Bulldogs run for an average of 168.3 yards per game on 33.9 attempts for an average of 5 yards per carry this season. They also run 69.2 plays per game and average 6.8 yards per play for a total of 470.9 yards per game. The Bulldogs get an average of 23.3 first downs per game and they average 45.7 penalty yards per game via 5.2 penalties. Louisiana Tech gives up 254.8 passing yards per outing and 23.9 points per game on the defensive side of the ball. They allow an average of 22.7 completions on 38 attempts per game for a completion percentage of 59.8. The Bulldogs give up 111.3 rushing yards per game on 33.1 carries for an average of 3.4 yards per carry. Louisiana Tech gives up 366.1 total yards per game including an average of 5.1 per play. They create an average of 1.6 turnovers per game and 6.4 penalties for 54.3 yards each game.